It's been a while since we've posted an Instagram photo story, but we had such an amazing time capturing images from the beautiful island of Maui we wanted to share them with you. As we make plans to share our travels more in the moment now that we are back on the road, we wanted to get our images of Maui out as soon as possible for you to see everything we were up to this past week. 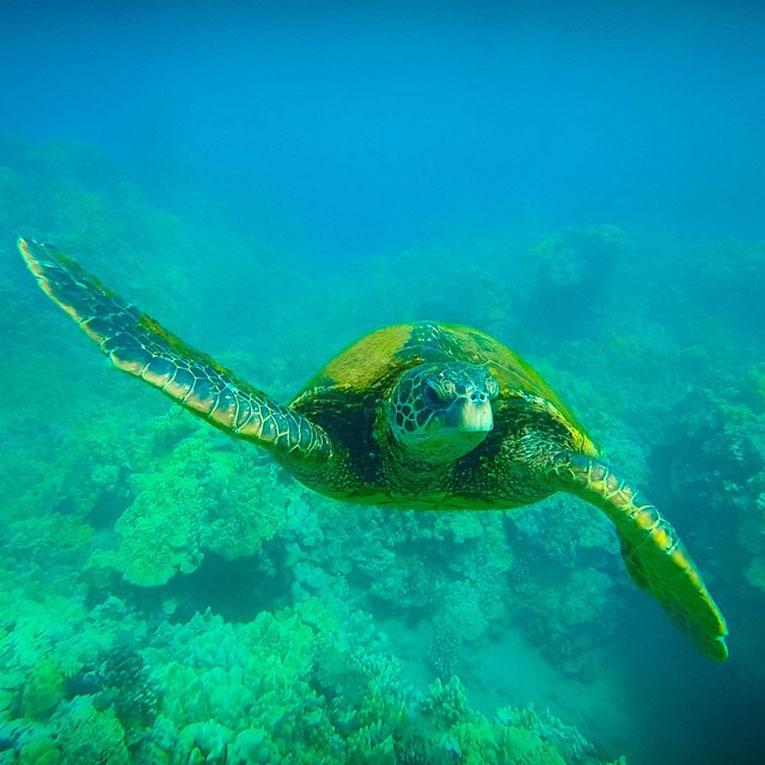 Snorkelling with sea turtles to hiking a bamboo forest, we had a wonderful time in Hawaii. These photos will give you a sneak peak of our trip to Maui. We had such an amazing day with Hawaiian Paddle Sports. We paddled an outrigger canoe, learned about the local culture and got to go swimming with sea turtles all in one morning. Such a special experience here in Maui. Our guide Tim was awesome. Full of information and just an all round nice guy. I always say it is the guides that make the experience and that definitely held true on this adventure. So if you are in Maui check these guys out. I can guarantee you won't be disappointed. 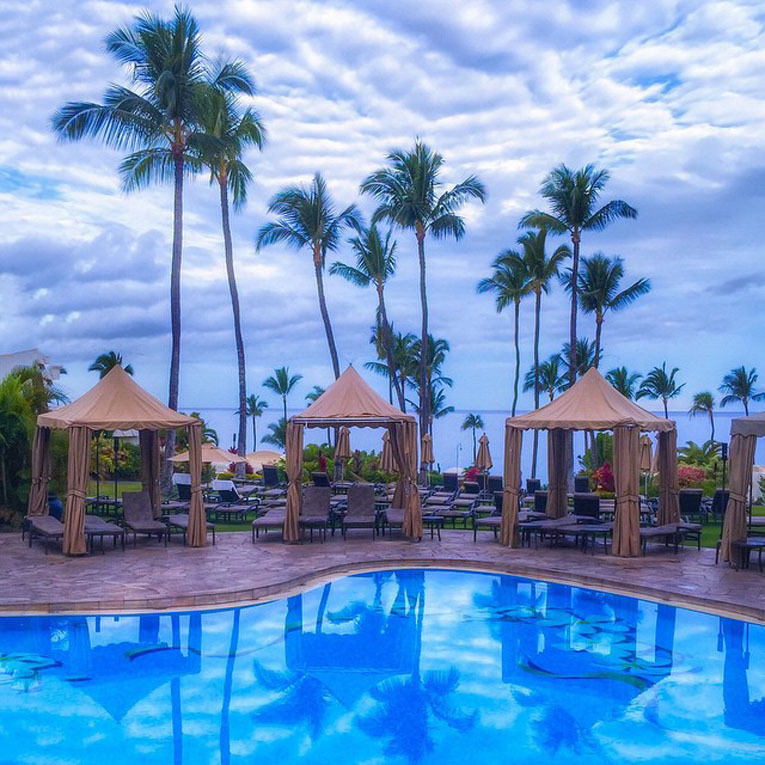 A good morning from the Fairmont Kea Lani in Maui. This was the beautiful view we woke up to every day in Maui. 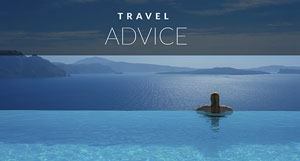 The Fairmont is an all suites hotel overlooking the ocean. Sitting on the balcony drinking coffee was a peaceful way to start the day. 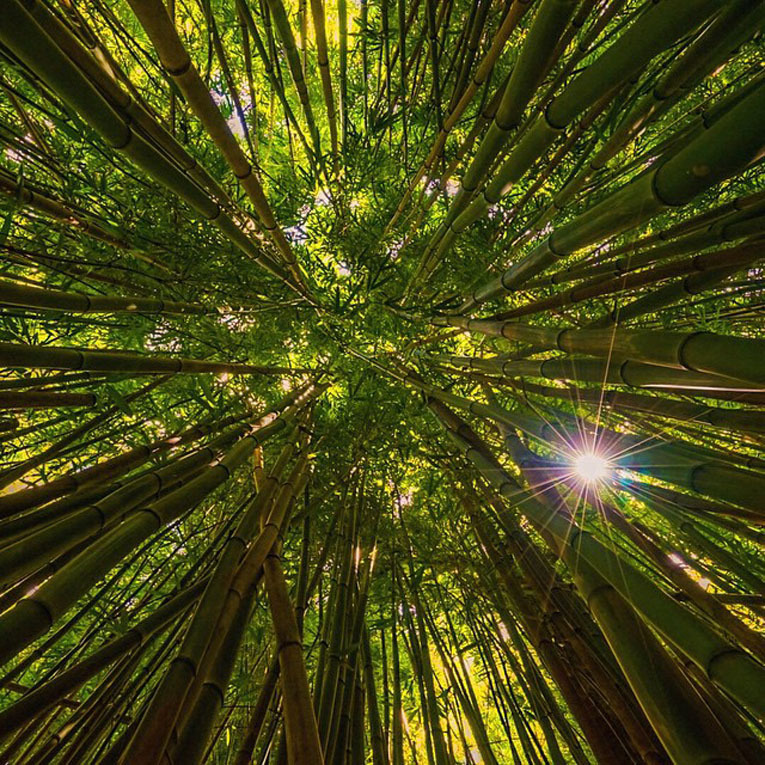 Look at this incredible walk in the Bamboo forest of Haleakal? National Park, Maui. 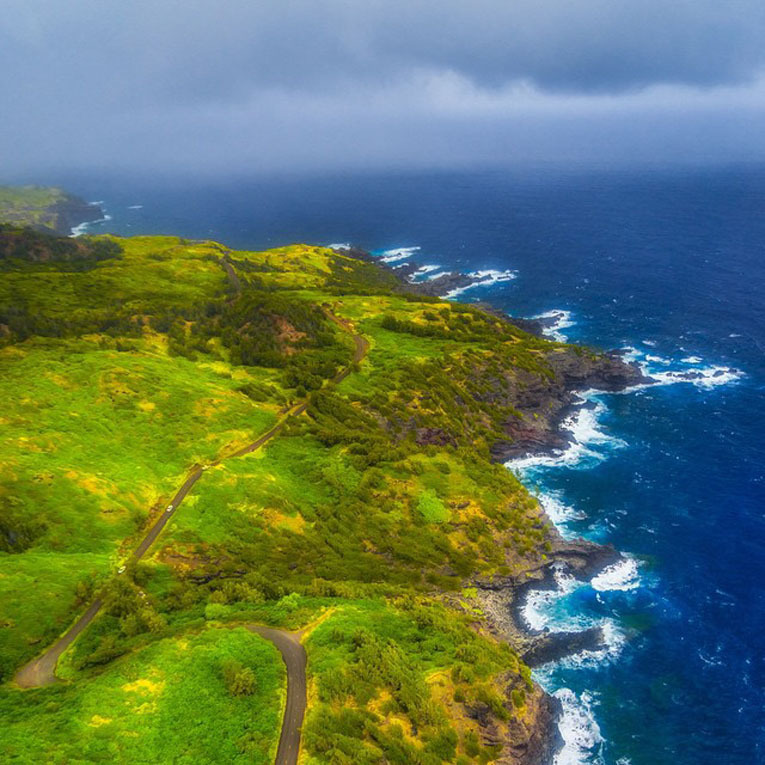 This National park is located 45 minutes outside the town of Hana but is worth the drive. Hana is a good two hours from Paia and it's a drive that is on many travellers bucket list. The single lane winding roads offer beautiful views with plenty of stops for hiking. But this park is the star attraction. After a 2 mile hike into the park we came across this giant bamboo forest. It was much larger than we expected and just walking through and listing to the bamboo clack like an old wind chime was so peaceful. As the sun set on the west coast of Maui it lit up the sky and the ocean with a magnificent rainbow of colours. When we were here before we saw some amazing sunsets but it seems that with each day that passes they get better and better. There is nothing quite like sitting and enjoying the sunset with the one you love in paradise. As we flew over the island of Maui on a breathtaking helicopter tour with Air Maui, it gave a great perspective on the coastal drives and the winding roads. This particular drive goes along Maui's north east coast and takes in the the Nakalele blowhole and tidal pools. This is just a one lane road and is a bit crazy to drive but worth it in my opinion. If you get a chance to drive it while in Maui you won't regret it. During our drive back from our day on the road to Hana we stopped here to take in the sunset just outside the surf town of Paia. Ho'okipa is a popular place for windsurfers and surfers alike. The wind was blowing and a storm was rolling in. Raindrops just started to fall as I snapped this final frame of the surfers enjoying the last bit of sun for the day. If you drive the Hana Highway, and you should, make sure to stop off at Ho'okipa for a magical sunset. You won't regret it. As we leave Maui after a great week we are treated to one of the best sunsets of the week. Staying in Wailea on the west side of the island was perfect for sunsets. The Fairmont has a sandy beach out front and during this evening, people were playing with their children as couples enjoyed romantic moments together. Wow! What a way to see Maui and the surrounding islands. 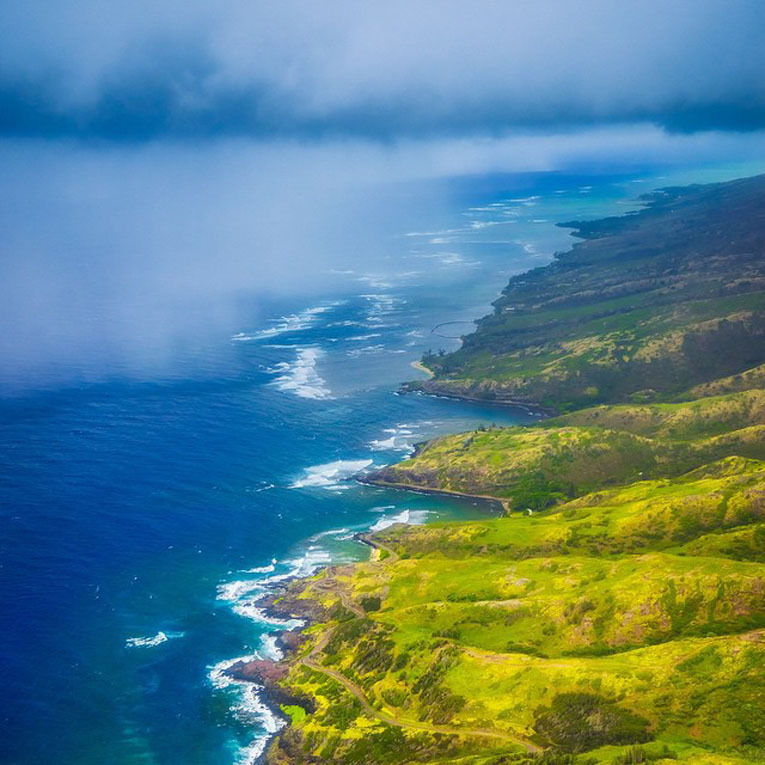 A helicopter flight with Air Maui is a perfect way to see the island. We've always wanted to fly over Hawaii, and we finally had our chance. As the music played through our headsets, we felt as if we were in a movie as we took in the extraordinary views. Mother Nature gave us a show with a storm passing through but it was the jaw dropping beauty of these islands that I was impressed with. I have never seen such lush green landscape in my life. 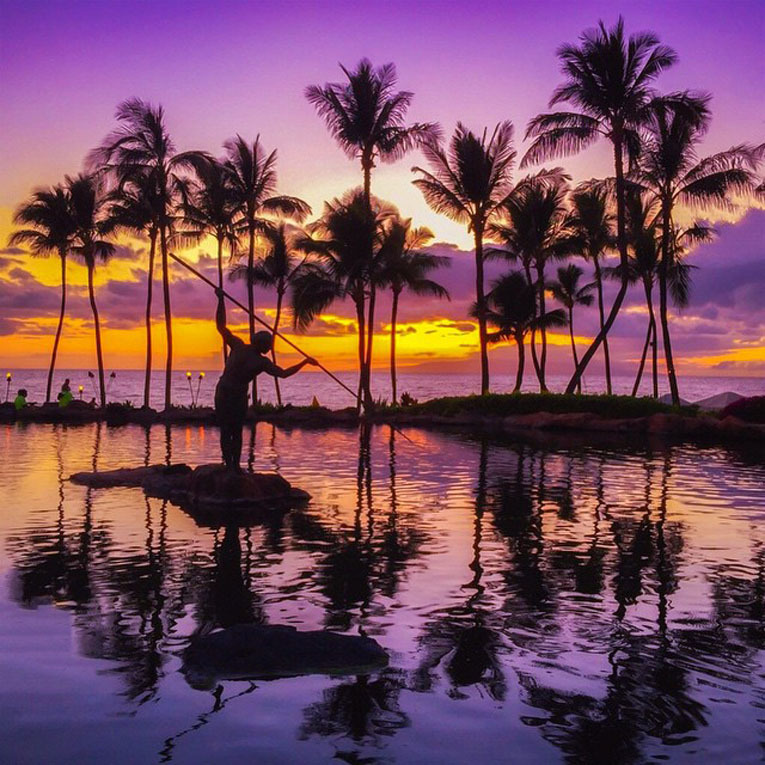 On the west coast of Maui lies the small town of Wailea. Not only is it home to some of the best beaches on the island it is also known for its stunning sunsets. This is a popular statue for sunset photographs and as we sat and dined at the beautiful Grand Wailea Resort couldn't resist pulling ourselves away from the delectable meal to snap some photos of our own as the sun went down. And that my friends, was our week in Maui. As we vacationed in Maui, we thought about how, if we were American we would live there. I remember asking a fellow Viewfinder why everyone doesn't live here? It's truly paradise. 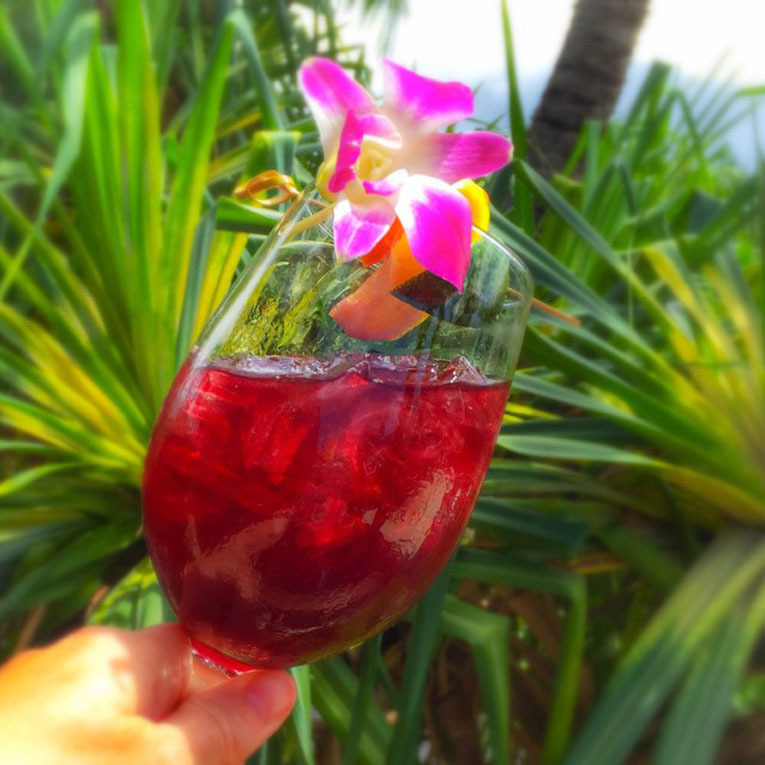 Have you been to Maui or Hawaii? What's your favourite thing to do on the islands? We've be sharing more stories and up coming videos on our Youtube channel. 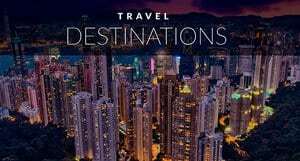 Make sure to subscribe for weekly travel videos! 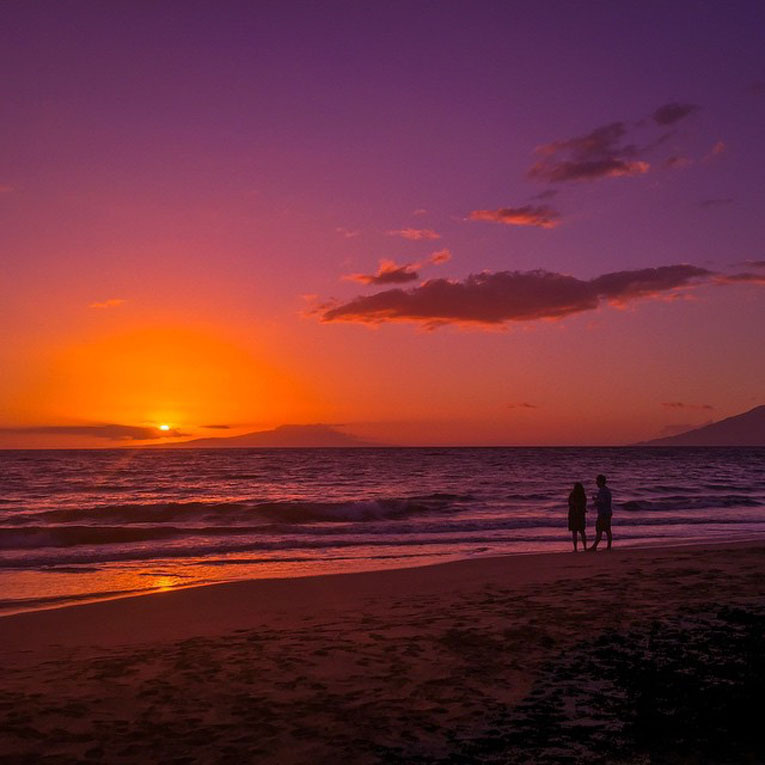 14 Responses to "Beautiful Maui, Our Week in Photos"
Absolutely stunning photos – thank you so much for sharing! Treks to bamboo forests and diving with turtles – definitely sounds like somewhere I’d love! Maybe one day I’ll get there! 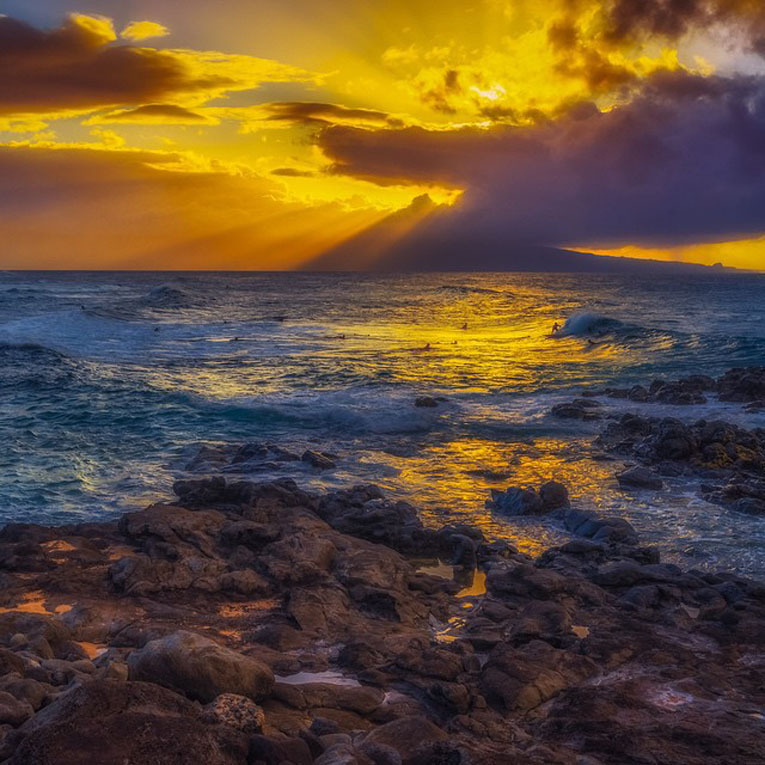 Wow Awesome Post and Maui is really a stunning place in Hawaii. 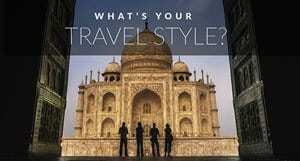 You guys are really awesome as you travel all along enjoying your life to fullest. You made my day . Thanks. Hawaii is pretty fabulous. We’ve only been to Lanai and Maui so far, but we’re looking forward to seeing the rest one day soon too! 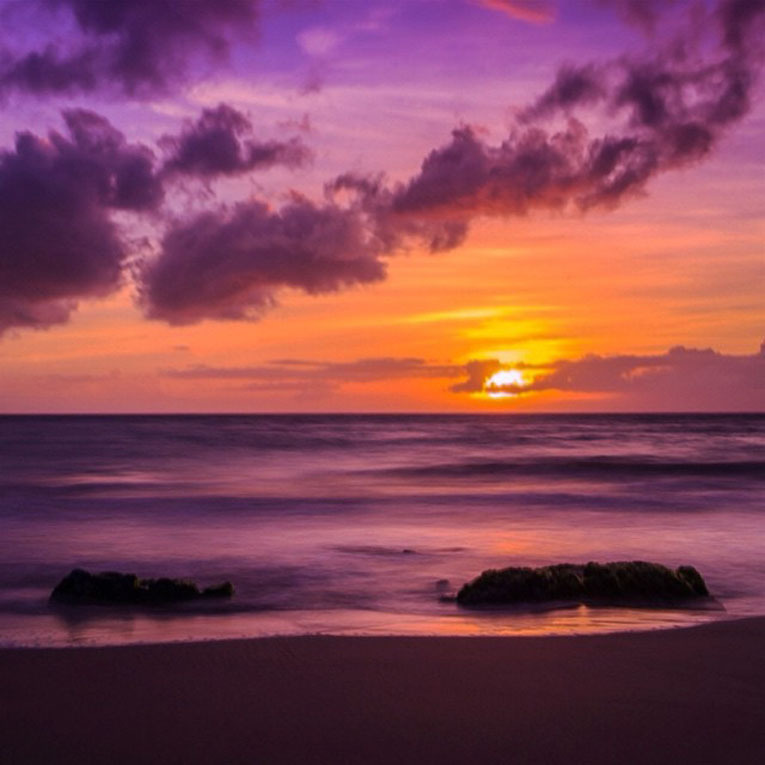 I have been to Maui and your pictures show that it is as beautiful as I remember it. My favorite place was the bamboo forest. Having been to Maui and other hawaiian islands, my next trip I think will be to the big island of Hawaii. But I will surely revisit Maui again. You pictures have got me all excited about going there again. I’d like to go to the Big Island as well. We’ve been to Maui twice, so it’s time to see some of the others. I’m glad we could get you excited about going back! A pleasure to meet you both LUV your pictures and memories! Mahalo to You both and Expedia for joining us here in Wailea! Thanks for having us Kathleen! We had an amazing time in Maui. There’s so much to do on the island and it’s soooo beautiful! Love the Waiea area. Such a delightful spot to be. it would seem that a heaven… stunning images. Such a lovely places like Maui that notwithstanding such a broad innovative headway and rage can be acknowledged just by coming to there and detecting the spot without anyone else. 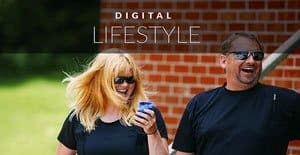 I’m so excited you were able to spend a week on Maui and enjoy some of my favorite activities! I look forward to seeing you soon. A hui hou! Such a beautiful places like Maui that despite such an extensive technological advancement and craze can be realized only by reaching there and sensing the place by itself. Bravo a great article to read and understand the might and power of the nature. Aw, that turtle is so grumpily cute! What an amazing week, I’d love to visit Hawaii, some friends of ours went over Christmas and New Year and the photos/stories they shared when they got back were awesome. That spearfishing sunset shot is so cool! Thanks Rachel, I think he was more uninterested than grumpy. He was just swimming along. Absolutely adorable. Thanks!